The XTENDEX® PS/2 KVM extender provides local and remote KVM (PS/2 keyboard, PS/2 mouse and VGA monitor) access to a PC up to 300 feet (91 meters) using CAT5/5e/6 UTP cable. The extender is available with optional stereo audio. Supports resolutions to 1920x1440. Also known as: KVM extender, cat5 kvm extension, kvm balun, keyboard monitor mouse extend, remote kvm cat 5, kvm range extender. The XTENDEX® KVM extender provides local and remote KVM (PS/2 keyboard, PS/2 mouse and VGA monitor) access to a PC or NTI KVM switch up to 300 feet using CAT5/5e/6/6a UTP cable. 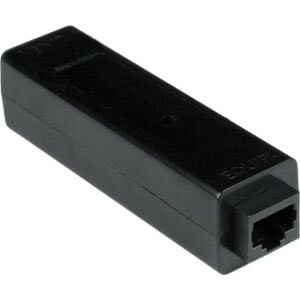 Use in-house CAT5/5e/6/6a wiring to locate a keyboard, monitor and mouse remotely. Optional VESA mounting bracket is available for mounting the local or remote unit to the back of a flat panel monitor. Male 15-pin HD/male 6-pin miniDIN connectors for PC or NTI KVM switch. Optional stereo audio support — 3.5 mm stereo plug. Optional stereo audio support — 3.5 mm stereo jack. Operating temperature: 32 to 113°F (0 to 45°C). Local and remote unit: 110 or 220 VAC at 50 or 60 Hz via AC adapter. The SP-CAT5-6V CATx Surge Protector protects equipment running on CATx unshielded twisted pair (UTP) cable against the effects of electrostatic discharge, faulty wiring and lightning. Use a protector on each end of the line to provide increased protection on each end against surges. 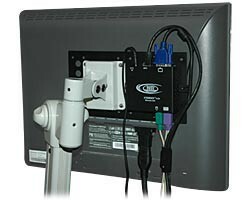 Use to mount the local or remote unit to the back of a flat panel monitor. Compatible with the local or remote unit. "NTI’s products are fantastic, but their customer service is even better. In 2007, I purchased an ST-C5KVMA-300 KVM extender that allows me to access my main PC from a monitor, keyboard and mouse over 120 feet away. NTI sold the product at a terrific price, installation was easy and effortless, and the device has worked flawlessly for over seven years. When a recent power outage appeared to have damaged one component of the system, Phyllis of NTI’s customer service department was simply fabulous. She was able to locate my old order, identify the specific model that I had, and obtain prices for replacing either an individual component or the entire system (and I was very pleasantly surprised to learn that the cost of the entire system had only increased by less than 5% since my original purchase seven years ago)." The actual problem was in my outlet and not NTI’s device (NTI’s products are bulletproof), so I didn’t actually need to replace any component. However, Phyllis and NTI have my heartiest thanks for helping me understand my options, and for being willing to go the extra mile for a customer. "I just wanted to drop you a note about how my install using your product went. The whole installation took practically no time at all and most of that was running the cat5 cable through conduit. I think this product (ST-C5KVM-300) is fantastic and the ease of use is just what I needed. I'm looking forward to more similar experiences."